(Catholic News Agency) Athough the Jubilee of Mercy has ended, Pope Francis has decided that some of the novelties he applied to the Church during the Holy Year will continue. He is allowing all priests to absolve the sin of abortion from here on out, while SSPX priests will be able to continue hearing confessions validly. In addition, he has indefinitely extended the mandate of the Missionaries of Mercy and has decided to institute the World Day for the Poor, which will take place each year on the Thirty-Third Sunday of Ordinary Time. 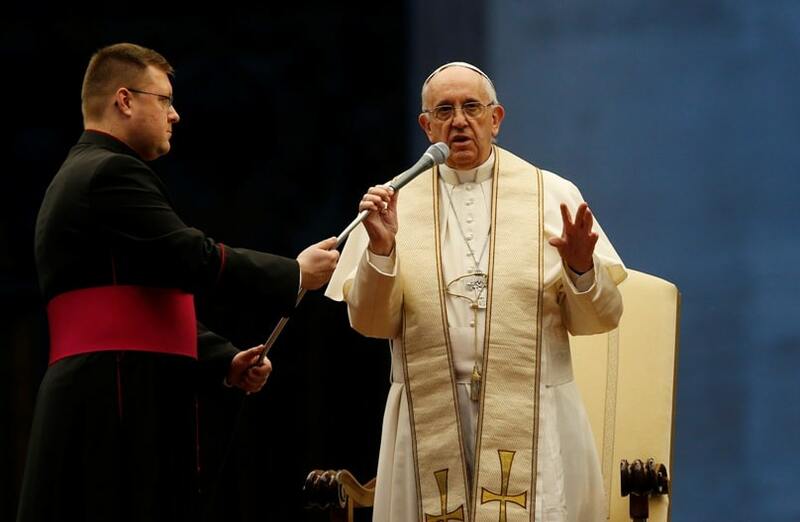 The Pope announced his decision in his new Apostolic Letter Misericordia et Misera, meaning “Mercy with Misery.” Published November 21, the letter was signed by the Pope November 20 during Mass for the close of the Jubilee of Mercy. “Given this need, lest any obstacle arise between the request for reconciliation and God’s forgiveness, I henceforth grant to all priests, in virtue of their ministry, the faculty to absolve those who have committed the sin of procured abortion,” the letter read. The Pope had initially declared that all priests could forgive the sin of abortion in a set of pastoral guidelines for the Jubilee issues September 1, 2015, in which he also granted SSPX priests the faculty to forgive sins in confession. A woman who obtains an abortion automatically incurs a “latae sententiae” excommunication, along with those who assisted her in the process. Because of this excommunication, the sin of abortion can normally only be absolved by a bishop, or certain priests appointed by him. For specific occasions such as Advent or Lent, some bishops extend this faculty to all priests within their diocese. In the US, the faculty to absolve abortion has already been delegated to all priests. However, the Pope’s new provisions take it to a universal level. In his new apostolic letter, Pope Francis also extended his decree allowing SSPX priests to hear valid confessions. The Society of St Pius X was founded by Archbishop Marcel Lefebvre in 1970 to form priests, as a response to what he described as errors that had crept into the Church following the Second Vatican Council. Its relations with the Holy See became strained in 1988 when Archbishop Lefebvre consecrated four bishops without the permission of Pope John Paul II. Pope Francis has taken several steps to move forward on the path of full unification with the SSPX Society, including the offer of a personal prelature, which is a Church jurisdiction without geographical boundaries designed to carry out particular pastoral initiatives. At present, the only personal prelature in the Church is Opus Dei. However, the SSPX Society has so far rejected this proposal. As another sign of his push for this emphasis on mercy to continue beyond the Jubilee, Francis also extended the special faculties given to the Missionaries of Mercy. On Ash Wednesday more than 1,000 priests were sent out around the world as ambassadors of mercy. Selected from every continent, the Missionaries of Mercy placed a special emphasis on their role as preachers and confessors. They were given two special faculties that are usually unavailable to the average priest, the first being that they were not limited in geographic location in terms of hearing confessions. Usually a priest has to ask permission from the local bishop before hearing confessions in a diocese other than their own, however for the Missionaries of Mercy that was not the case. A second aspect of the Missionaries’ mission was that they were able to absolve sins in cases otherwise reserved to the Holy See. Though there are several such sins, the Holy See clarified that the faculties of the Missionaries of Mercy were limited to just four: Profaning the Eucharistic species by taking them away or keeping them for a sacrilegious purpose; the use of physical force against the Roman Pontiff; the absolution of an accomplice in a sin against the Sixth Commandment (“thou shalt not commit adultery”) and a direct violation against the sacramental seal by a confessor. Bishops were encouraged to contact Missionaries of Mercy in nearby dioceses and invite them to come to their own. “It is the time of mercy for each and all, since no one can think that he or she is cut off from God’s closeness and the power of his tender love,” he said, and pointed especially to those who are weak, vulnerable and excluded. “This Day will also represent a genuine form of new evangelization which can renew the face of the Church as She perseveres in her perennial activity of pastoral conversion and witness to mercy,” he said. “Because each of us has experienced at length this loving gaze of God, we cannot remain unaffected, for it changes our lives,” he said, encouraging all to become witnesses of mercy. Mercy ought to be “celebrated,” he said, above all in the liturgy and in the Sacraments, particularly those of penance and the anointing of the sick, as well as in scripture and, for priests, in their homilies. He spoke of the importance of showing compassion and consolation to others, and offered a special word of closeness to families and married couples amid the various challenges they face. “We have to remember each of us carries the richness and the burdens of our personal history; this is what makes us different from everyone else,” he said. “Yet death must be faced and prepared for as a painful and inescapable passage, yet one charged with immense meaning, for it is the ultimate act of love towards those we leave behind and towards God whom we go forth to meet,” he said, and emphasised the importance of the priest in sharing in this moment. He also placed a strong emphasis on practicing the corporal and spiritual works of mercy, which he said are “proof of mercy’s immense positive influence as a social value” in modern society. While many signs of mercy were carried out during the Jubilee, “this is not enough,” he said. Francis encouraged the faithful to “make every effort” to come up with both “specific and responsible” ways of practising charity and the works of mercy. “Mercy is inclusive and tends to expand in a way that knows no limits. Hence we are called to give new expression to the traditional works of mercy,” he said.